Hard to believe the first week of vacation is already over. In the first week we put 1,100 miles on the car. When we drove 6 hours to Connecticut, we trusted the GPS and ended up in the Bronx when we needed to take a detour due to an accident. That was an experience but at least the GPS kept us in the right direction. I love our basic little GPS. Our second part of the trip was to travel to Pittsburgh and pick up our dogs. 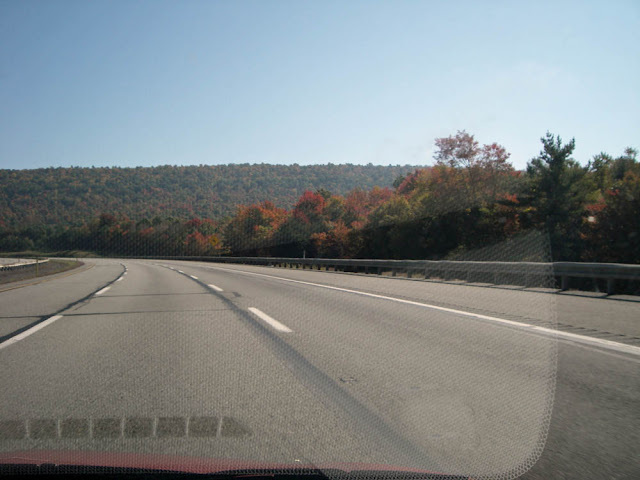 It's funny but the leaves were changing more on our way to Pittsburgh than in Connecticut. Hubby took some photos from the car but you really can't see the colors from inside the car window. Next on the agenda, several things to get done around the house and a few little day trips. Next week, I plan on loading the pink quilt on to the HQ16 and starting on quilting it!